He Had A Successful Career, A Selfless Wife, And Three Loving Children. When high school sweethearts Karen and Richard Sharpe married, they shared an interest in medicine, a desire for family, and a dream for the future. For Karen, that dream became a nightmare. After years of abuse at the hands of her physician husband, she put an end to their 26-year marriage. Fearing a crushing divorce settlement, Richard ended the marriage first by unloading a .22-caliber rifle into Karen’s chest. The murder revealed more about the millionaire doctor-and his double life-than polite Boston society was prepared for. He Also Had A Secret That Shot His Picture-Perfect World To Hell. Behind the doors of their upscale Massachusetts home, Dr. Sharpe was a compulsive cross-dresser with a penchant for his own daughter’s underwear-a respected family man who had not only been taking hormones to grow breasts, but who stole his wife’s birth control pills to supplement them. 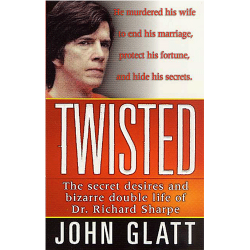 But not even his own family could have imagined that it would take cold-blooded murder to finally reveal the good doctor’s disturbing secrets, and shatter forever the prosaic façade of an all-American family.